Where does the name “R-matrix” come from? In quantum integrability and related topics a lot of not-so imaginative terminology is used. One may hear people talk about "Q-operators", "R-matrices", "S-matrices", "T-operators", as well as "L-operators". In fact, this has further led to even less poetic names such as "RTT-relations" and "RLL-relations". My question is if anyone knows what the origin of this terminology is: where and when were they first used? I am particularly interested in this for the name "R-matrix", and why the letter "R" was chosen. The physical roots of quantum integrability lie in several different areas, which has led to quite a few examples of terminology that (only) makes sense in one of these contexts. An example is "auxiliary" vs "quantum" (or "physical") space: this is sensible nomenclature for spin chains in the quantum-inverse scattering method, but arbitrary from the vertex-model viewpoint. In any case, having these different possible origins makes it a bit harder to trace back terminology. After a bit of research my best guess for an explanation of the origins of the above terminology is as follows. I'd be glad for any corrections or comments. The S-matrix was probably first; it comes from QFT, and the "S" stands for "scattering". In quantum-integrable cases many-particle scattering can be factorized into two-particle scattering processes, and the consistency condition for this factorized scattering is a version of the Yang-Baxter equation. Perhaps, then, the R-matrix's name (or notation $R$) was chosen to resemble "S-matrix" (or $S$). Note that Yang writes $Y$ for the R-matrix. Baxter usually uses $w$ (or $W$) for the vertex weights, i.e. the entries of the R-matrix: he seems to prefer the star-triangle relation, i.e. the Yang-Baxter equation in components. According to Perk and Au-Yang the notation "R" comes from the Leningrad school. In can further imagine that Baxter might have denoted his operator by $Q$ to continue this (anti)alphabetic sequence. Finally the names "RTT-" and "RLL-relations" just represent the form of those equations (expressing the quasitriangularity of the R-matrix for a representation) given the preceding notation. This answer refers to what is probably the first appearance of an $R$-matrix in the context of quantum mechanical scattering theory. Quite possibly the later appearances in the context of the inverse scattering method happened independently. The $R$-matrix of scattering theory was introduced by Eugene Wigner in the paper Resonance Reactions, Physical Review 70, 606 (1946). He writes that he chose this symbol because it has the dimension of length ("radius"). The scattering theory in terms of the $R$-matrix was worked out in detail in a subsequent paper by Wigner and Leonard Eisenbud, and that is the reference that is often cited as the origin. According to http://link.springer.com/article/10.1007%2FBF01076717 the method of the classical r-matrix first appeared in the paper "On the complete integrability of the Landau-Lifshitz equation" by Evgeny Sklyanin: https://www.researchgate.net/publication/247031108_On_the_complete_integrability_of_the_Landau-Lifshitz_equation In this paper I have not found any explanation why the nomenclature r was used. In the paper http://www.mathunion.org/ICM/ICM1983.2/Main/icm1983.2.1331.1346.ocr.pdf L.A. Takhtajan mentions that L.D. Fadeev gave a very elegant interpretation of the r-matrix in the language of the representation theory. So, in retrospect, we can assume that R means "representation theory". I could not resist: in the meanwhile I have searched the literature further. I think the following is an interesting addition to my best guess from the OP, which is why I have chosen to share it, even if it isn't the definitive answer to my question. received by the editors on June 1, 1979. The authors were certainly familiar with the term "S-matrix", so it is not strange that the matrix R would quickly have gotten a similar name. 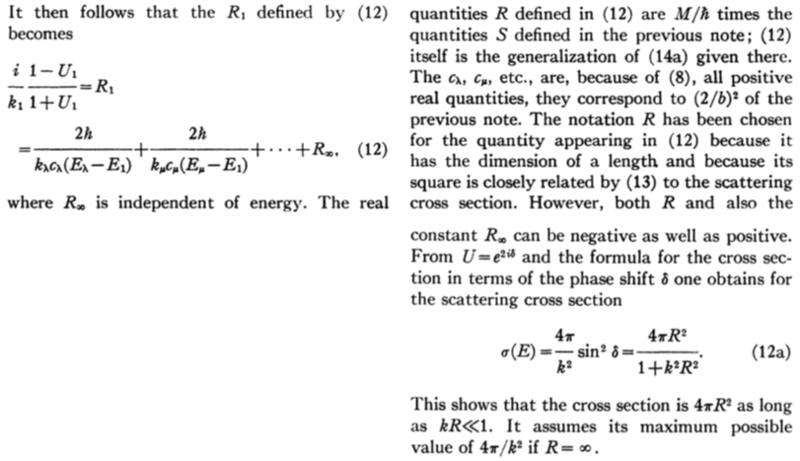 Faddeev, "Completely integrable quantum models of field theory", preprint Leningr Otd Mat Inst, P-2-79, Leningrad (1979); in: Problems of Quantum Field Theory, Dubna (1979) 249 (Russian). These might also mention the R-matrix, which would push the earliest occurrence back a bit futher, but I cannot find those references online. It would be great if anyone could provide a link to a digital version of either of these papers! for the operator containing the local Boltzmann weights at the vertices. I can't find earlier sources where "R" is used in this context; in particular it is not used in the references of Baxter's paper. Thus it seems reasonable to assume that Sklyanin et al adopted Baxter’s notation for the R-matrix. Not the answer you're looking for? Browse other questions tagged mp.mathematical-physics ho.history-overview qa.quantum-algebra terminology notation or ask your own question. Where does the Givental reconstruction formula come from? What is the relationship amongst all the different kinds of spectra? Where does the term “torsor” come from? Where does the name “Reynolds operator” come from? Why does the type-A subdivision algebra look like the Rota-Baxter algebra axiom?